Kadie Heinle received the Gills Club Scholarship to attend a Shark Biology and Conservation Course at Shoals Marine Lab during the summer of 2018. Read below to learn about her experience! It’s been about one month since I finished my Shark Biology and Conservation course at Shoals Marine Laboratory (SML) and I finally have the time to let you all know how it went. In short, it was an absolutely amazing learning experience. Our professor, Dr. Heather Marshall, and teaching assistant, Maggie Winchester were both incredible and I truly enjoyed learning from them. I am so grateful to the Gills Club and its donors for the opportunity to attend the course. I’ll admit that traveling to Appledore Island at first gave me a few doubts about the intelligence of missing work to fly across the country and attend class for two weeks. I had a bit of a planes, trains, and automobiles journey to get to the island (minus the train and plus a boat). After flying all night to Boston, Massachusetts, I survived my first solo Uber ride to the bus station and found myself wishing I could trade the tall buildings and busy roads of Boston for the mountains and Lochsa River that I had left in Idaho. Thankfully, my bus trip up to Portsmouth, New Hampshire (another first for me) passed by uneventfully and I found a lot of comfort stepping into the charming coastal town. After finding my way to the SML dock a few hours early, I went on a hunt for a Moxie soda based on the suggestion of one of my coworkers. Both my coworker and the lady who sold me the soda warned me that it might taste like motor oil, but I was pleasantly surprised to find out that the New England specialty had more of a minty, Dr. Pepper taste. I then spent the next few hours exploring Portsmouth before hopping on the Kingsbury (one of SML’s boats) to Appledore Island. The course itself was both challenging and rewarding. Our days were long and full of lectures, labs, and studying everything we could about sharks, skates, and rays in two short weeks. My favorite parts of the course were our labs and field days. We had the chance to dissect a few spiny dogfish (Squalas acanthias) and it was so interesting to first learn about the internal anatomy of these sharks, then to see it first hand. We had a few pregnant dogfish in the batch that we dissected, so we were able to see the embryos at different development stages, which was really interesting! My favorite lab was when we practiced processing blood samples towards the end of the course. We were hoping to have collected blood samples from sharks during our fishing/field days, but unfortunately we had little luck in catching a shark. Instead, one of the other classes brought us back a few mackerel (Scomber scombrus), which we used for our blood samples instead. Our days in the field were simultaneously amazing and frustrating. Amazing in that we were spending multiple hours out on the water fishing, but frustrating in that we were never able to catch a shark. However I think our field days provided the most realistic lesson in shark research, in that you need a lot of patience and perseverance to succeed in the field. Another major positive of the field days were that we had the chance to see some of the other common fish species in the Gulf of Maine. We caught a few rockfish (Sebastidae spp. ), cod (Gadus morhua), haddock (Melanogrammus aeglefinus), and mackerel. It was such a cool opportunity to see these species close up, especially cod, as that is such a culturally and economically important fish. Additionally, being out in the field afforded us the chance to see other wildlife such as dolphins and a minke whale (Balaenoptera acutorostrata). So overall, our days in the field were a blast, despite the disappointment of not actually catching sharks. Overall, I learned so much more in two weeks than I ever would have thought possible. There are so many more intricacies and subfields within the field of shark research than I could have imagined. In addition to the specific lectures taught by Heather and Maggie, we had guest speakers talk to us either in person or on a video chat to talk further about different areas of shark research. These guest speakers were an invaluable part of the class for me. Having the chance to talk to Dr. James Sulikowski in person about steps to take after I graduate and hearing from Megan Winston about careers in quantitative fisheries were both incredible opportunities for me. The Shark Biology and Conservation course was an incredible learning experience for me. I came away from my time on Appledore Island with a greater appreciation for the field of shark biology and great new friendships. I can’t thank the Gills Club enough for providing this opportunity! I would definitely recommend that other aspiring female scientists check out this scholarship in the future! My name is Kadie Heinle and I am the lucky recipient of the Gills Club scholarship for Shoals Marine Laboratory’s (SML) shark biology and conservation class. I am so excited to take the course in the next week or so! I just wanted to take the opportunity to say how grateful I am for receiving the Gills Club scholarship (without which I wouldn’t be able to attend the course) and give a little information on my background and why taking this course is important to me. My initial love for fish began on the Yellowstone River in eastern Montana where I grew up. Our family’s cattle ranch is right on the river, so most of our summer activities revolved around fishing or floating the river. I am additionally fortunate that the travel bug continually bites my mother and our family took several family trips to warm places. One such vacation to Florida to visit my aunt and uncle is responsible for my undying love and obsession with the ocean. On that trip, I experienced snorkeling for the first time. We were at John Pennekamp State Park, there was a moderately strong current, the most exciting thing I saw was queen conch, I accidentally drank salt water a few times, and I was absolutely in love with this new and enchanting world I had just discovered. Although I have had several incredible experiences with the ocean since then, I typically look back at that moment as instrumental in directing my life to the ocean. I chose to attend the University of Montana (UM) to study wildlife biology both for the in-state tuition and for the world-class degree program. (Go Griz!) I am now heading into my senior year with about seven classes left to earn a Bachelors of Science in wildlife biology and minors in climate change studies and mathematics. Every year at UM I have become more grateful for the opportunity to learn from and work with such amazing professors. They have helped me gain the skills and qualifications necessary to earn jobs, internships, and other opportunities such as this Gills Club scholarship. My initial interest in sharks and rays started where I’m sure it did with many others…watching Shark Week on Discovery Channel. I found the most captivating shows to be the ones featuring researchers either tagging sharks or discovering new species of sharks. I distinctly remember thinking, “Wow, someone gets paid to work outside with sharks? I want to do something like that.” However, as I researched what it would take to become a shark biologist, I became discouraged at the competitiveness and tried to move my focus to more ‘achievable’ career goals and admired the field of shark biology from afar. My mindset changed one day last summer when I had the incredible opportunity to volunteer with Mote Marine Laboratory’s Spotted Eagle Ray team. I was interning at Mote for a different project (I was working on a seatrout bioacoustics project for my National Science Foundation Research Experience for Undergraduates), but the spotted eagle ray team was short a pair of hands and I was allowed to help them out for the day. It was probably my favorite day all summer long. We netted four eagle rays that day, I helped take measurements and write down data. I was enchanted by the eagle rays and spent my free time in the ensuing weeks reading research articles about them and other elasmobranchs. The more articles I read, the more interested I became in the various aspects of shark and ray biology and life history patterns. The research that most caught my eye was focused on migration and habitat selection patterns. While at Mote, I took the opportunity to meet with one of the shark researchers there to talk about my interests. That conversation renewed my hope in pursuing a career studying sharks and has led me to seek out opportunities such as this class at SML. Currently, I am interested in careers that will either allow me to study life history aspects of elasmobranchs that are impacted by climate change or how human activities (i.e. commercial or recreational fishing) can be modified to lessen stress on elasmobranchs. The latter path interests me because I like to see how we can work with people to better coexist with wildlife. My career interests tend to shift with the different courses I take in school and experiences I have at work, so I am very excited to see how this class will shift my perspective. Leading up to and following the class this summer I have an awesome job on a snorkel crew for Idaho Fish and Game out of Lewiston, Idaho. (We are looking at steelhead and Chinook salmon parr abundance.) My employers were gracious enough to let me take the time off of work for the class and I am so grateful to them! I am really looking forward to my two weeks at Appledore Island and can’t wait to learn more about sharks. 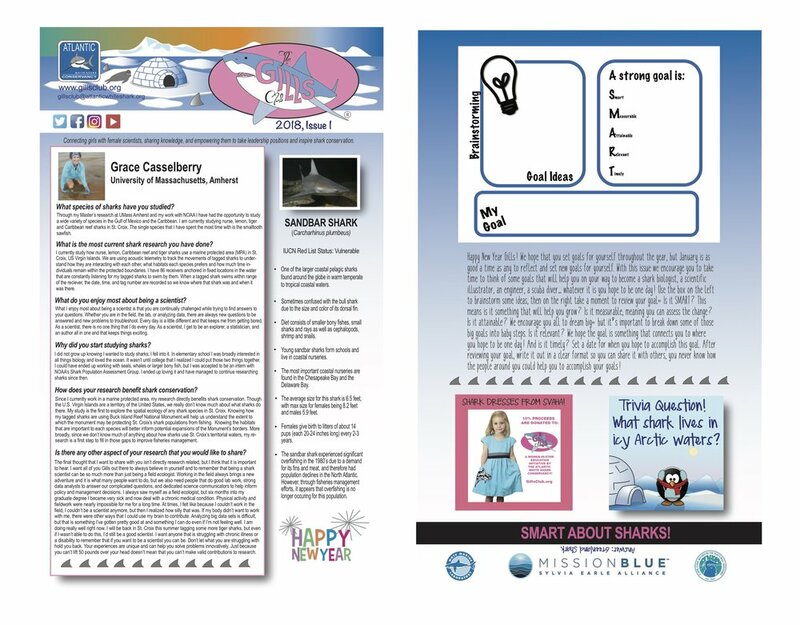 The first newsletter of 2018 features Science Team member Grace Casselberry!